President Trump speaks to CNN journalist Jim Acosta during a news conference at the White House earlier this month. 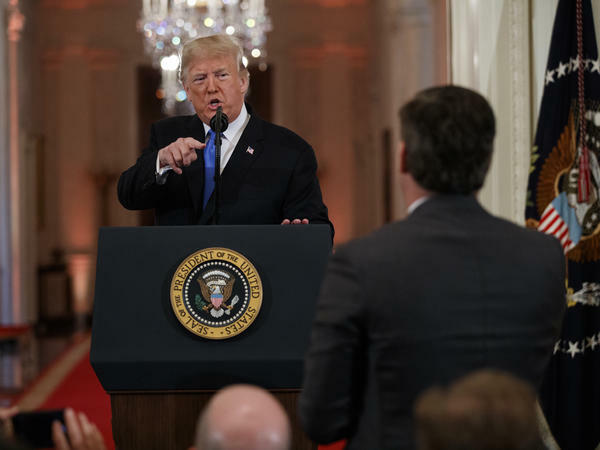 CNN has filed a lawsuit against the Trump administration after the White House suspended CNN Chief White House Correspondent Jim Acosta's press credentials. The White House took away Acosta's "hard pass," which allows credentialed reporters to attend White House events without obtaining daily access permission, after a contentious news conference last week in which President Trump called Acosta a "rude, terrible person." CNN's complaint, filed Tuesday in U.S. District Court for the District of Columbia, calls the move "an unabashed attempt to censor the press and exclude reporters from the White House who challenge and dispute the President's point of view." "While the suit is specific to CNN and Acosta, this could have happened to anyone," CNN said in a statement to NPR. "If left unchallenged, the actions of the White House would create a dangerous chilling effect for any journalist who covers our elected officials." The lawsuit against Trump, senior White House officials and the Secret Service argues that suspending Acosta's press credentials violates his First Amendment rights to free speech and his Fifth Amendment right to due process. It demands that his credentials be immediately restored or, if not, that the matter be heard by a neutral arbiter. It's also seeking a declaration that the decision to suspend the credentials was unconstitutional. The suit is expected to get its first hearing in U.S. District Court for the District of Columbia on Wednesday. Trump has repeatedly criticized CNN's coverage of his administration, criticism that he has leveraged at many other mainstream news outlets. He has previously described "much of the Media" as the "Enemy of the People." At the tense Nov. 7 briefing, Acosta asked the president about his characterization of a migrant "caravan" moving through Mexico as an "invasion" and about possible indictments in the Russia investigation. Initially, when the White House said it was suspending Acosta's credential, it said it would "never tolerate a reporter placing his hands on a young woman just trying to do her job as a White House intern." That's a characterization Acosta and CNN strenuously dispute. White House press secretary Sarah Sanders tweeted out a link to a video to back up her claim that Acosta physically fended off the female staffer. Multiple media reviews by such outfits as The Washington Post, The Associated Press and the social media company Storyful (owned by News Corp., which is financially controlled by the Murdoch family) concluded that the video Sanders cited had been doctored. In an interview with Fox News Sunday, White House counselor Kellyanne Conway denied that the video had been altered but then said it had been "sped up" and that "they do it all the time in sports to see if there's actually a first down or a touchdown." Sanders said in a statement Tuesday that the White House will "vigorously defend against this lawsuit," and she called it "more grandstanding from CNN." "The First Amendment is not served when a single reporter, of more than 150 present, attempts to monopolize the floor," Sanders said. "If there is no check on this type of behavior it impedes the ability of the President, the White House staff, and members of the media to conduct business." Acosta, a veteran political correspondent, said in court documents that the press credential is "essential to my job." He added: "The White House is my workplace and where I spend my working days virtually every day the president is in Washington." According to the complaint, Acosta traveled to Paris to cover Trump's trip there several days after his credential was suspended. "Although the French government issued credentials to Acosta, the Secret Service refused to allow Acosta to attend an allegedly 'open' press event whose attendees included journalists from around the world," CNN said in the lawsuit. "Without his press credentials, Acosta's ability to perform his duties as CNN's Chief White House correspondent is effectively eliminated." There is legal debate about whether denial of the pass in this case constitutes a violation of the First Amendment. As media law professor Jonathan Peters of the University of Georgia writes, the "critical fact was whether access was 'generally inclusive' of press. If 'generally inclusive,' then excluding a [journalist] arbitrarily or absent good cause would implicate the First Amendment." In 1976, a Washington correspondent for The Nation magazine, Robert Sherrill, sued the director of the U.S. Secret Service after his application for a permanent, or "hard," White House press pass was denied, based on the Secret Service recommendation that it be rejected a decade earlier. An appellate court ruling did not grant him the pass but found that Sherrill was owed a fair application process, including an opportunity to be informed of the reasons for the rejection and the chance to rebut the administration's grounds for denial, under his Fifth Amendment right to due process. The court also held that "the denial of a pass potentially infringes upon first amendment guarantees." A variety of free speech groups have expressed support for CNN's position. In a statement, White House Correspondents' Association President Olivier Knox said the organization strongly backs CNN's efforts to restore Acosta's credentials. "Revoking access to the White House complex amounted to a disproportionate reaction to the events of last Wednesday," Knox says. "The President of the United States should not be in the business of arbitrarily picking the men and women who cover him." For the last two years, President Trump has regularly insulted and attacked CNN and its reporters. Last week, the White House revoked the press pass for CNN's chief White House correspondent Jim Acosta. The White House says Acosta failed to show respect questioning the president. Today, CNN filed a lawsuit arguing that the administration is violating CNN's constitutional rights. NPR media correspondent David Folkenflik joins us now. Hi, David. SHAPIRO: What's CNN asking for with this lawsuit? Is there more to it than just getting back the White House press pass? FOLKENFLIK: Well, in the short term, they want a temporary restraining order from a federal judge to say, hey, for now you can't have it revoked. And the White House is apparently required to offer a written response by 11:00 tomorrow morning. And then there's a hearing tomorrow afternoon, which tells you how quickly this is being addressed. In a greater sense, CNN is saying, look, Jim Acosta and CNN's First Amendment rights are being violated. That is, they are asking questions the press finds inconvenient or uncomfortable. And his Fifth Amendment rights are being violated. That is, there was no due process here. He says he learned about it by reading about it from other media accounts and announcements and didn't have a chance to appeal it. Jeff Zucker, the head of CNN, tried to talk to the White House chief of staff to say, hey, let's resolve this, and heard nothing back. SHAPIRO: What's the White House response today? FOLKENFLIK: Well, the White House's press secretary, Sarah Sanders, said this is just more grandstanding by CNN. They intend to defend it vigorously. And, you know, they had said that this was in part done because Jim Acosta had put his hands on an intern trying to get a microphone back from him. I've got to say, that seemed to be a totally baloney reason. She circulated on Twitter a video to support that case that everybody analyzing it said was doctored. Now what they're saying is that, you know, they're failing to show respect. Indeed, President Trump on November 9 talked to reporters and saying it might not just be limited to Jim Acosta, but in fact he could consider revoking press passes of other reporters. Here's what he said. PRESIDENT DONALD TRUMP: When you're in the White House, this is a very sacred place to be. This is a very special place. You have to treat the White House with respect. You have to treat the presidency with respect. FOLKENFLIK: President Trump underscoring the idea that you have to show respect to him and deference in order to continue being able to get this pass to the White House press room. SHAPIRO: Is there any precedent for this, other times a reporter has had a press pass revoked? FOLKENFLIK: Well, there isn't precise precedent for this. But perhaps the best case involves a ruling by a federal circuit court of appeals back in 1977 in which they said the Secret Service, in denying a press pass to a reporter for The Nation magazine, hadn't made clear that it was doing so in real time and hadn't made clear why it was doing in real time. It didn't give him back the pass, but it gave him a procedure and said he has to be able to appeal this if other reporters are getting access to this general room and if - you know, this can't be done in an arbitrary way or absent very good cause. SHAPIRO: Do legal experts think CNN has a strong case? FOLKENFLIK: They kind of do. They think that this has shown to be capricious, that there's no strong reason on First Amendment grounds for the White House to have acted that way, but this seems to be done out of pique. The only concern that you're hearing from people in the press and from lawyers, as well as from news executives and figures like Bob Woodward, is the question of whether this was a wise move. That is, the president has so often tried to make this presidency of his a case where he's in battle with the press to sue the president. To make it the case of Cable News Network v. President Trump, as it reads in the court document, really embodies that fight. And at the same time, there are media experts, media executives and lawyers, who say sometimes the fight is worth fighting even if it's on the ground that the president wants. SHAPIRO: NPR media correspondent David Folkenflik. Thanks, David. (SOUNDBITE OF MICHAEL BROOKS' "IONISM") Transcript provided by NPR, Copyright NPR.